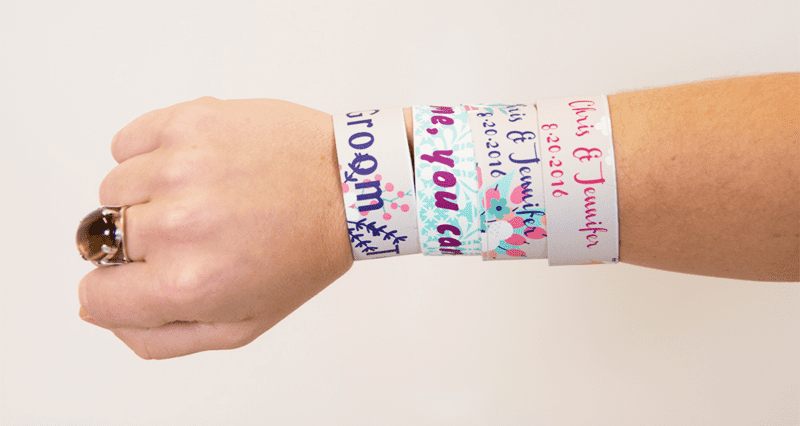 Customize Your Next Big Event with DIY Slap Bracelets! Are you busy planning for your big day and searching for the perfect party favor to showcase your crafty side? Today on the blog, Spoonflower team member Meredith shows you how to use just one Woven Wallpaper swatch to make customizable covers for DIY slap bracelets, perfect for weddings, birthday parties, or your next big event! 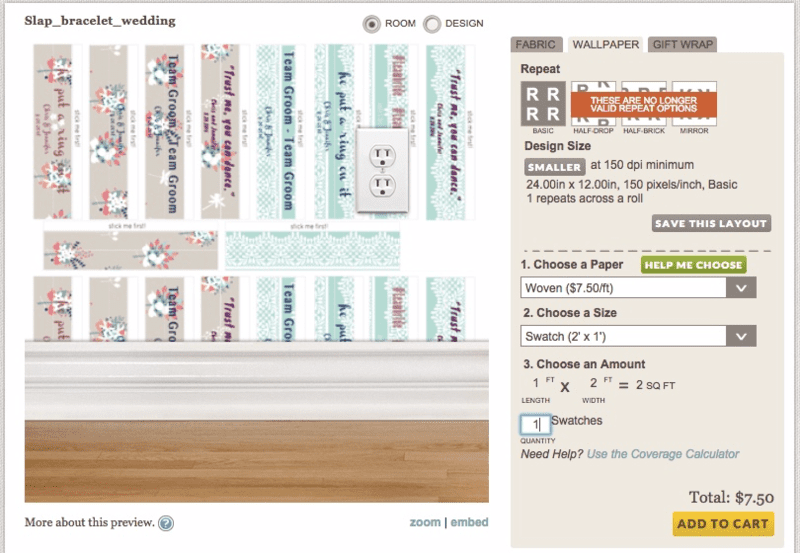 Meredith: With National Wedding Month in full swing over here at Spoonflower HQ, I’ve had white dresses, cake toppers, and party favors on the brain. 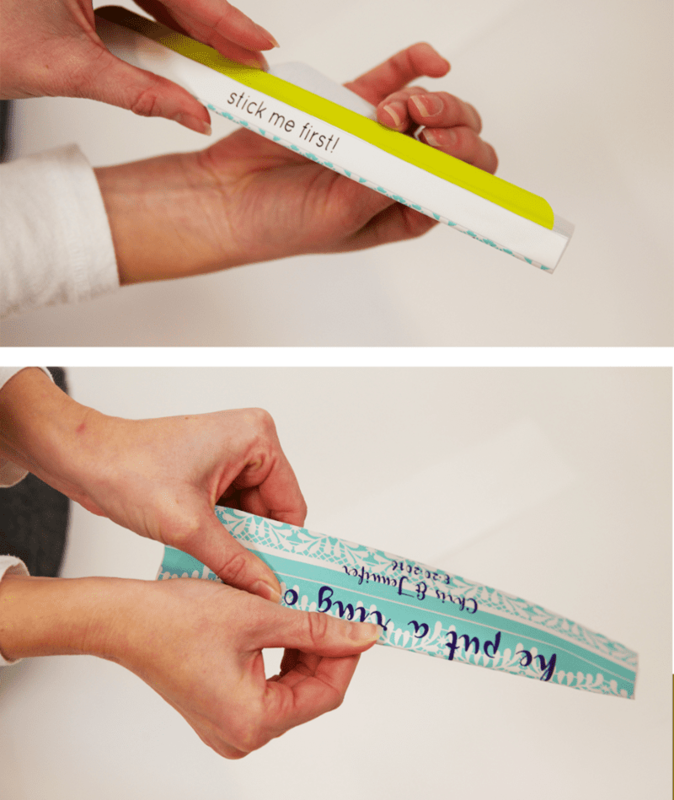 Why not mix it up on your big day and surprise guests with an easy DIY slap bracelet station?! 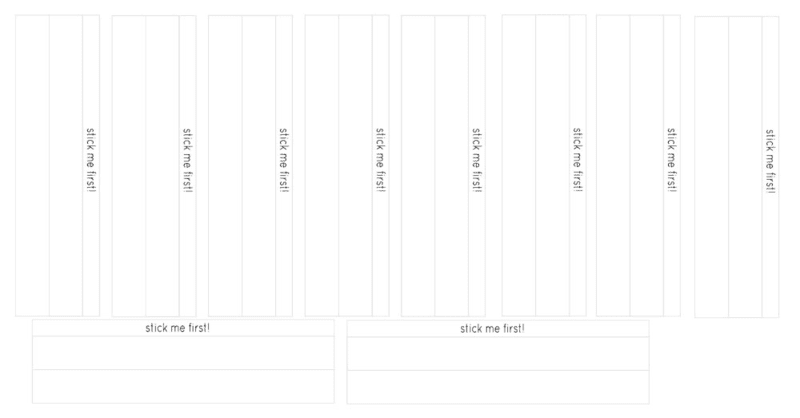 Before getting started, you’ll want to download the slap bracelet template we’ve created for you. 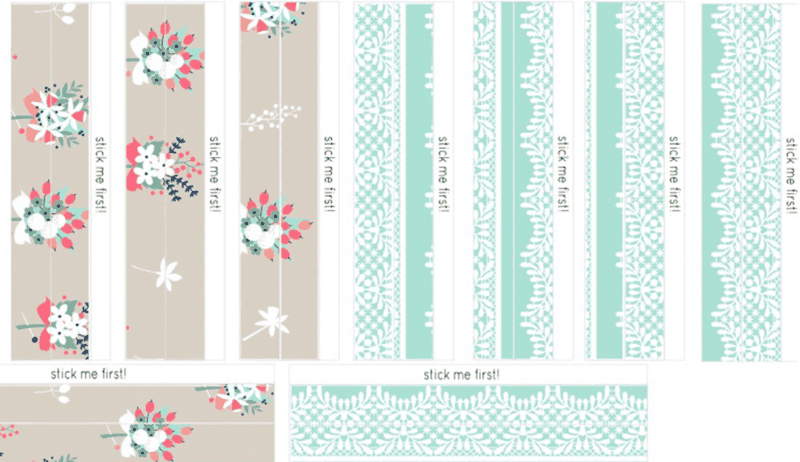 The template is sized to have 10 bracelets for every foot of wallpaper ( 24"x12"). 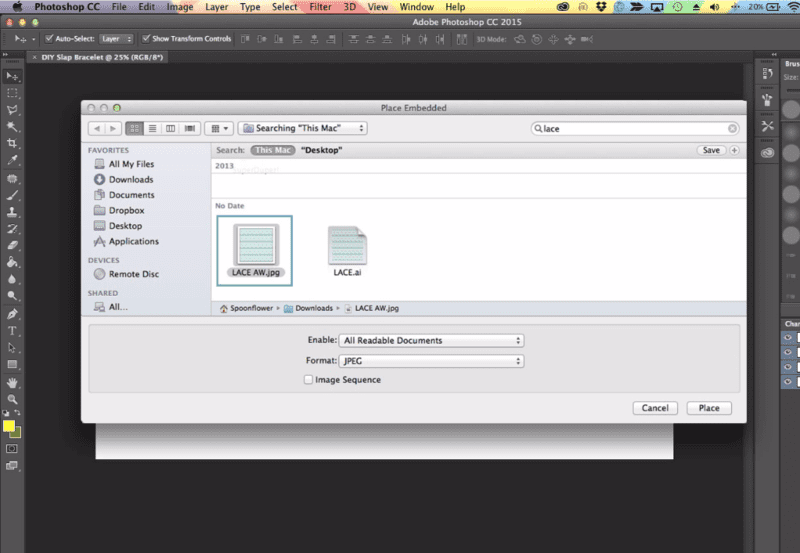 Once you’ve downloaded your file, open up Photoshop and create your file. Your canvas should be 24” wide x 12” tall set at 150 dpi. 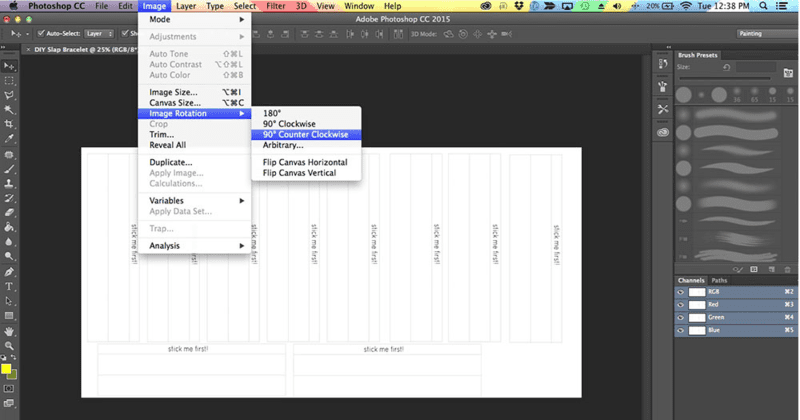 Once you’ve placed the template on your file, rotate the canvas 90° by selecting Image –> Image Rotation –> 90° clockwise. This is optional but I find it’s easier to layout the text on each bracelet. Now comes the fun part….customizing each bracelet! To help save some time on the design process ( every second counts when you're planning for the big day! 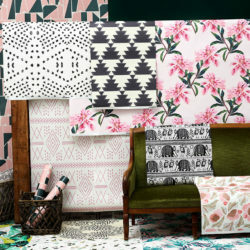 ), I’ll be using the very talented Ceri Staziker (Cerigwen) designs she created just for Spoonflower’s Digital Download series. To remove the current white background so the custom design shows through, select your Magic Wand tool in the tool bar and click on thw section of the bracelet template you do not want to be white. Once selected, hit the “delete” button. 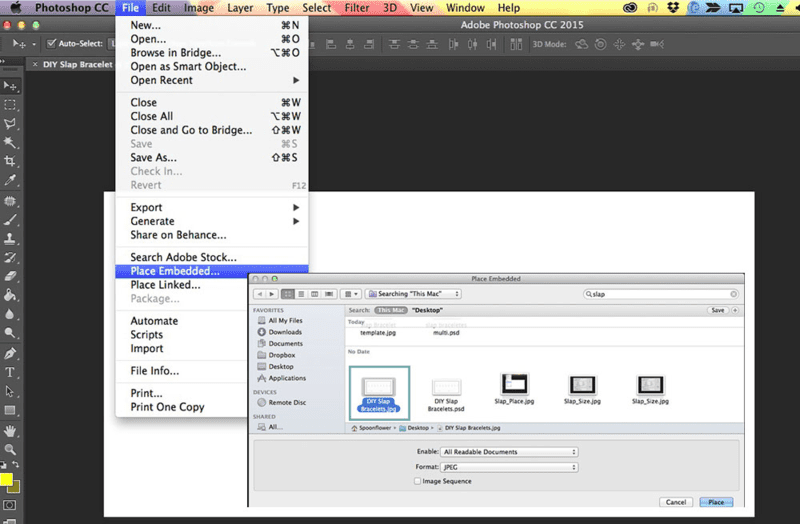 Next, place the Digital Download file on your canvas by selecting File –> Place Embedded –> and select the new file. 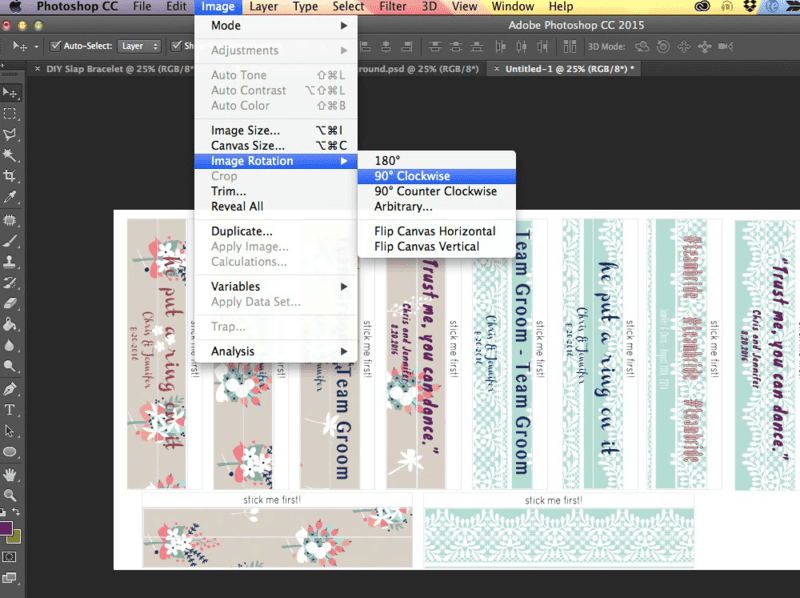 If you need to re-arrange your layers to keep the patterned background underneath the bracelet template once on you canvas, select the design layer on the LAYERS window and drag+drop until it is underneath the bracelet template. As you can see, I’ve added two different patterns, but you can add as many as you’d like! 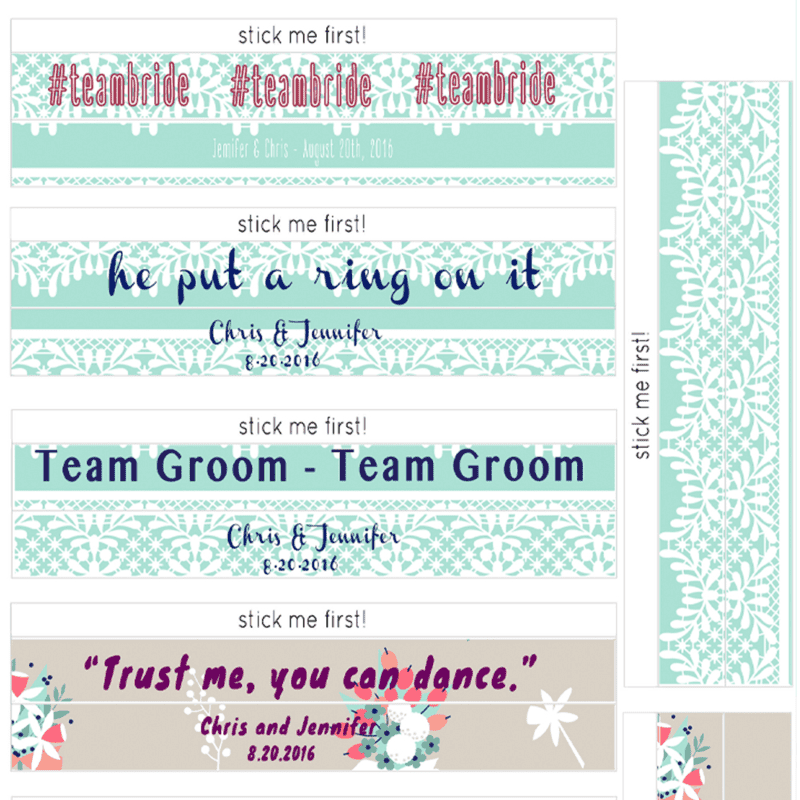 Next, I used my text tool to customize the bracelets. If your big day has a hashtag (ex. #chrisandjennifergethitched), this is a great time to put it in the spotlight! Once you've finished your bracelets, rotate the canvas 90° so your design is 24" wide x 12" tall and save the file as a JPG or PNG. 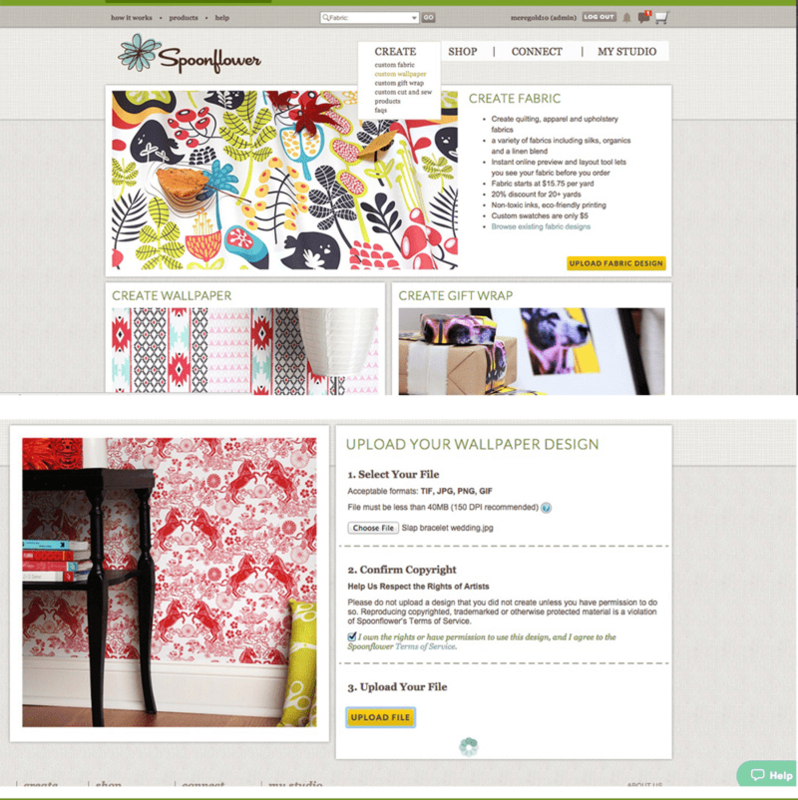 To upload your file to Spoonflower, select the Wallpaper option in the CREATE drop-down menu. 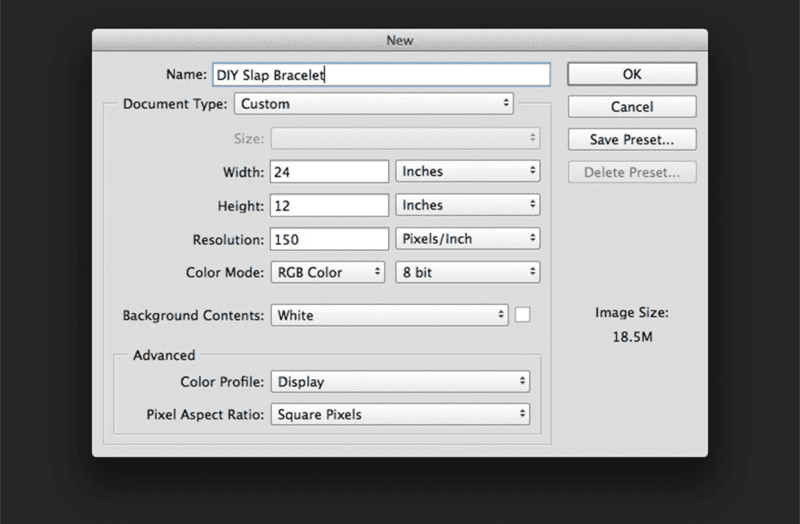 Then, select Choose your File and double click on your saved slap bracelet design. Once you're ready, select UPLOAD File. To complete your order, select WOVEN and SWATCH in the drop-down menus on the wallpaper page and select the yellow "Add to Cart" button! Once you receive your sample swatch, it's time to make the slap bracelets! By the way, we removed the cover of the slap bracelet to expose the metal ruler. This helps to ensure a smooth finish after applying the wallpaper! 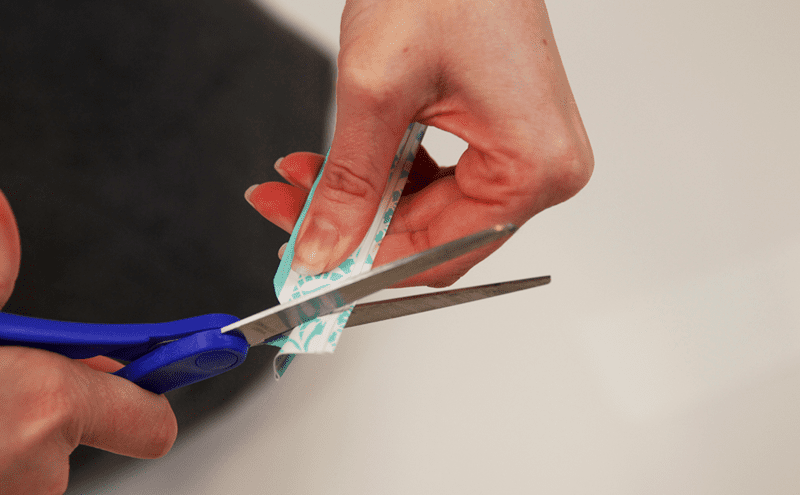 After cutting on the cut line of one bracelet, peel the backing off of the woven wallpaper. Next, place the "stick me first" portion of the paper about half way up on the side of the bracelet that curves out. 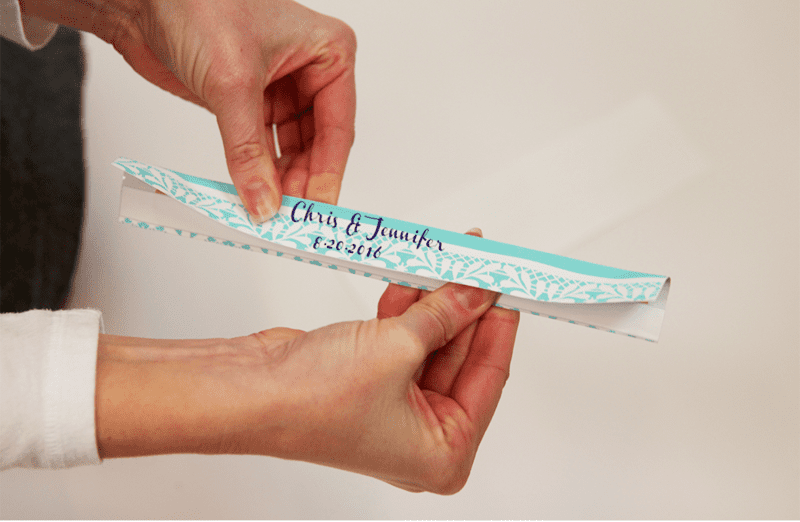 Wrap the paper tightly around the curved side of the bracelet, making sure to push out any air bubbles as you go. The design that is placed on the inside curve of the bracelet will be the design that shows when worn on your wrist. Continue to wrap the paper over the bracelet until you have covered the entire area and press firmly to make sure the paper adheres to the bracelet. Round the corners of the excess paper that extends the bracelet base. 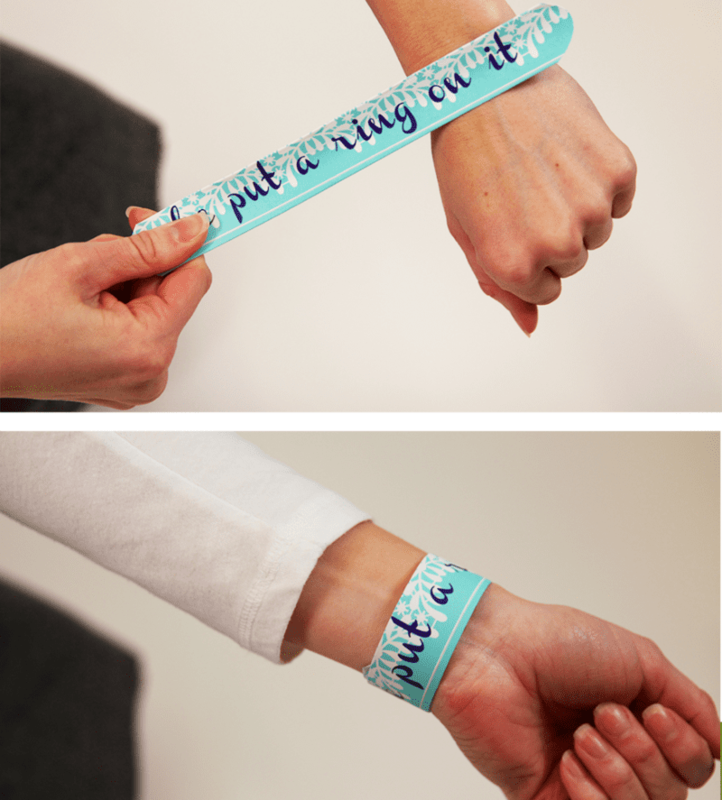 Thinking of including customized slap bracelets at your next soiree? Be sure to tag #spoonflower so we can see the finished results! Fun idea and great tutorial! It’s fascinating that these commercial slap bracelets were made from metal measuring tapes (a factory deciding to repurpose old products?) 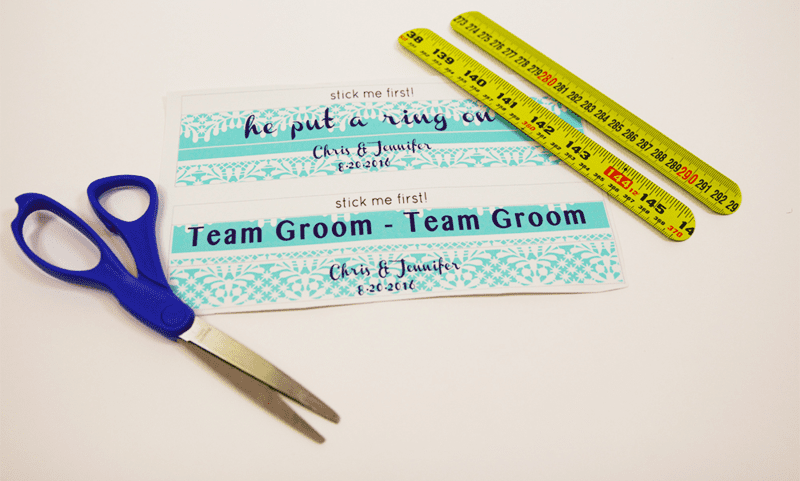 I suppose you could also upcycle an old measuring tape if you didn’t want to order these! Order slap bracelets on kipptoys.com!!! 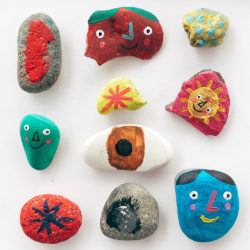 We had a lot of fun making them and even got to test them out at our local children’s museum this past weekend! If you end up making your own bracelet, we’d love to see the finished results! Thanks for visiting the blog! We had no idea slap bracelets were metal rulers until we peeled over the plastic covering. It was quite the surprise! If we weren’t making 1000 bracelets for an event, I think we would have gone with the upcycled method! Just keep in mind the type of scissors you use when cutting the ruler! Great tutorial! 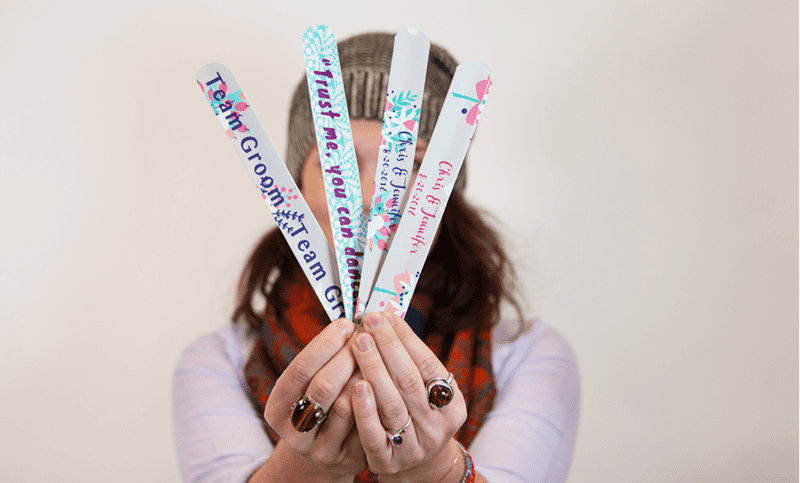 Slap bands are a unique and fun way to get your message out. People love to use these bracelets as promotional giveaways, fundraising items, awareness bands, or gifts for any occasion. 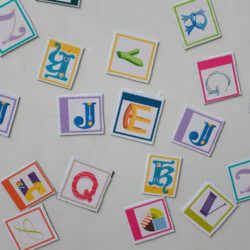 Nic article …Thanks for your great information,I am so much excited after reading your blog. Your blog is very much innovative and much helpful for any industry as well as for the person with your Interesting tutorial. Now these days, Wristband is the trendy business promotional product ,It becomes so popular or in used in raising awareness too vastly among people. As we WristbandsNow are manufacturers of the wristbands and make wristbands on demand. We are leading source for the personalised wristband and you can design your own wristbands with your own message, color,font, and size.